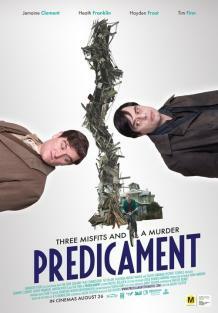 I will admit right off the bat that I had never heard of this New Zealand movie ‘Predicament’ until I was invited to the press screening and I also had no idea it was based on a New Zealand book either. After a bit of research prior to the screening, I found out that it was directed by Jason Stutter who directed the super-low budget comedy action film ‘Tongan Ninja’ a few years back and a low budget horror comedy ‘Diagnosis: Death’, so that gave me a bit of an insight into what this film would be like. So, with the bare minimum of knowledge about the film, I sat down to what I hoped would be a nice little surprise of a film. First off, the movie is set in the 1930’s and the production values and production design of this film are top notch! But I have to say that the film itself didn’t live up to the look. I felt it was slightly over directed by Stutter and the script was weak and had an even weaker ending, though of course that could be the book's fault, but I’ll leave that debate to someone who has read the book as well. So, for me, overall the film was pretty average. However, it will forever stay in my memory, as about 30 minutes into the film a drunk, abusive film critic had to be thrown out by me and a few of the other male audience members. So I did miss 10 minutes of the film at that stage, but that incident will stay in my mind more than the film itself!